Non-golfers suppose our sport to be a little tame, grey even. But even the rad-est of surfing/skating/skiing/base-jumping dudes - guys whose adrenaline doesn’t start flowing until they exceed 250mph or run off the edge of a 14,000ft mountain - might feel an unexpected frisson of excitement when hitting a 7-iron with a curious bull elephant or lion standing just a few feet away. He might exercise a little more caution than he’s accustomed to if putting on a green on which a 25ft-long crocodile is spread out in the sun. 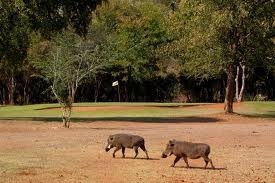 Sightings such as these are commonplace at Elephant Hills GC in Victoria Falls, Zimbabwe. A Gary Player design that opened in 1974, Elephant Hills lies just a couple of miles from the awesome Victoria Falls, and is frequented by wildlife you might not get at Green Valley Ranch or Riverdale Dunes. While golfers certainly need have their wits about them, there is no express danger of being eaten or gored by the local fauna. The elephants, lions, and water buffalo are kept behind electric fences for the most part, and the ponds in which the crocs lurk are well-signposted. You will certainly encounter waterbucks, kudus, other antelopes, and a great many warthogs on your journey round this extraordinary course, but while you may get a cold stare from an unsuspecting buck or hostile grunt from a less-than-impressed warthog they are not to be feared. If you can get yourself to the capital Harare, let Golfing Zimbabwe take over from there. Owned by Brendan Smith, a local whose parents emigrated from England to what was then Rhodesia in 1956, Golfing Zimbabwe offers two adventure-packed 11-day tours taking in not only Elephant Hills but also the excellent Leopard Rock in Mutare and a couple of first-rate Harare courses, one designed by Nick Price. Fishing tours, safaris and numerous other activities can be worked into the itinerary. Government elections will be held in June of this year, and though both Mugabe and Tsvangirai have called for peace at the polls, it might be wise to keep any eye on the situation before making any travel plans. Getting to, then playing, Elephant Hills could be a trip too far for some people, taking them way, way out of their comfort zones. For those whose comfort zone extends far beyond the standard dimensions, however, it might be just what the (witch) doctor ordered.